Many retail stores (such as grocery stores, pharmacies, and convenience stores) stock products that they are only legally allowed to sell at certain times. For instance, a grocery store that sells alcohol may only be permitted to sell it during specific hours, or a pharmacy may only be allowed to sell certain medications if there is a pharmacist on-hand to explain them. Whatever the reason, it’s critical that the aisles or areas that stock these products be secured to prevent unwanted access. Failing to properly secure these areas can not only result in customer confusion, but it can also lead to increased theft, and potentially legal action if you allow these products to be accessed during restricted hours. One excellent way to keep these areas secure is by using physical security. 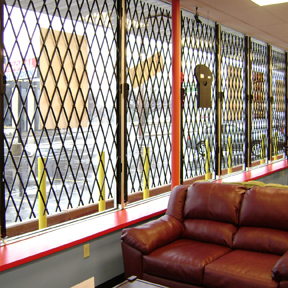 Physical security gates prevent access, which keeps customers out of certain areas while simultaneously preventing theft. Items like medication and alcohol are common targets for criminals. By placing a physical barrier around these aisles or sections of the store, you make it physically impossible for anyone to enter the area. Physical security gates also serve as a visual barrier. Not only does this stop criminals from striking, but it immediately lets customers know that these areas are off-limits and that the products behind the gates are not for sale. You do not have to spend time explaining the situation or having a customer bring items to the cash only to be disappointed that you can’t sell them. Physical security gates provide security and prevent hassles. Portable access control systems are mobile security gates which can be unlocked, taken apart, and moved away by store staff. This means that they can be easily maneuvered out of the way when they are not needed, providing easy access to all products in a store. However, when they are required, they can quickly be positioned into place and locked, restricting access and keeping the required areas off limits. This ease of use and flexibility makes them perfect for retail stores, especially those that need to restrict access to certain areas each night. It does not take a lot of time and effort to lock them into place, and the process goes very smoothly, so it can easily be done while the store is remains open to the public. Ease of use is critical as many stores do not have a lot of time (nor do they have the available staff) to use difficult methods of restricting access. If the process is lengthy, confusing, and time-consuming, not only does this detract from the overall management of the store, but it could also discourage staff from properly securing the necessary areas. Portable access control systems accomplish their goals quickly, easily, and at a reasonable price. You do not have to spend money to have staff or security guards monitor off-limits areas and you will comply with all legal requirements for selling certain products, which keeps your store in compliance with the law and government regulations.